There’s not long to wait before the Johnstone’s Decorating Centres’ Bonanza Sale! Starting Monday 12th November, the six-day event offers huge discounts and must-have bargains, exclusively at Johnstone’s Decorating Centres. There are fantastic deals on a range of trade favourites and brand-new products, including 35% off 5L tins of Johnstone’s Trade’s Cleanable Matt and StainAway Matt. You can also bag an exclusive Bonanza bargain on a Hamilton Prestige 5-piece brush set for £9.89! That’s not all – for one week only, decorators can get their hands on any two 5L tins from Johnstone’s Trade Aqua range in Brilliant White and Magnolia for just £30 each. There are also huge discounts on 10L of Johnstone’s Trade Covaplus and Jonmat, with prices from just £14.85. 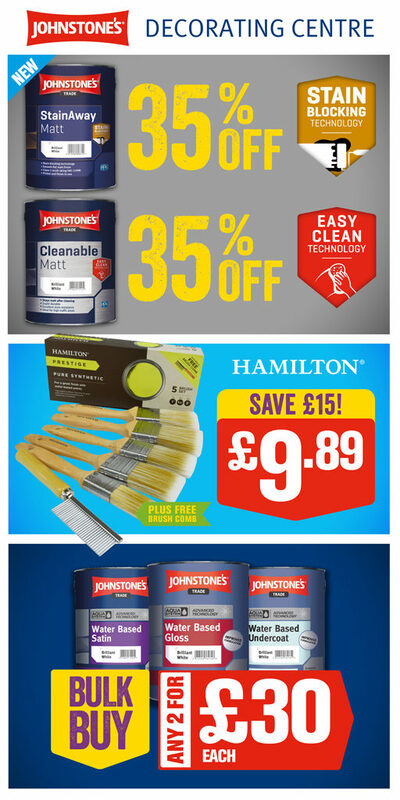 For more details on all the offers, or to find a local Johnstone’s Decorating Centre or Peffer Paint Decorating Centre, visit: www.paint247.co.uk. The Bonanza sale must end on Saturday 17th November 2018!